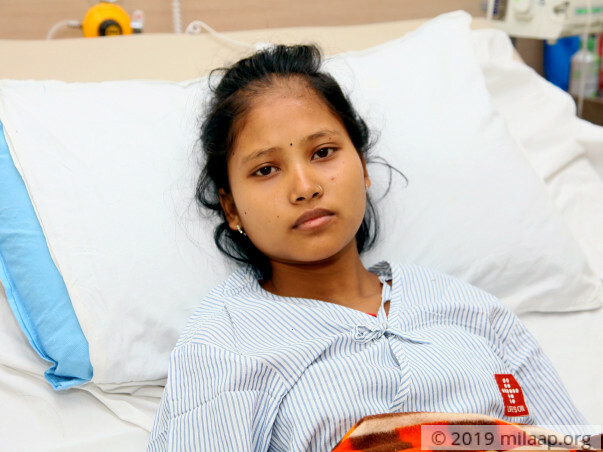 Instead of studying for her class 10 exams, 16-year-old Beauti Sarkar is in a hospital suffering with severe pain due to bone cancer. She awaits therapy and a limb-saving surgery while her father does all that he can to save her. He has begged and borrowed to keep Beauti’s treatment going but has no other way left to get her the surgery she now needs. Beauti is a class 10 student in a rural government school. She was to appear for her board exams in a few months but, she can barely walk without support these days and has become extremely weak. She doesn’t eat or speak much.She is awaiting a surgery which could get rid of the tumor and possibly save her leg. Unfortunately, her father can't to provide for the much-needed surgery anymore. “Beauti is so intelligent and sensitive. She’s a hard-working student too. Back in our village, the nearest doctor is over 50 kms away. 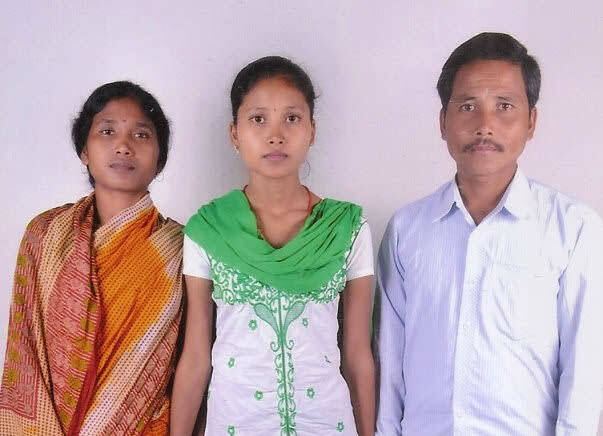 Beauti wants to become a doctor to help the people of the village.,” said Haripada, Beauti's father. In September 2017, Beauti suddenly had severe pain in her right leg. Residing in rural West Bengal, Beauti and her father, Haripada, had to go 50 km away from home to Raiganj. In a month, Beauti’s tests showed that she had Osteosarcoma, a type of bone cancer which originated in her right shinbone (tibia). 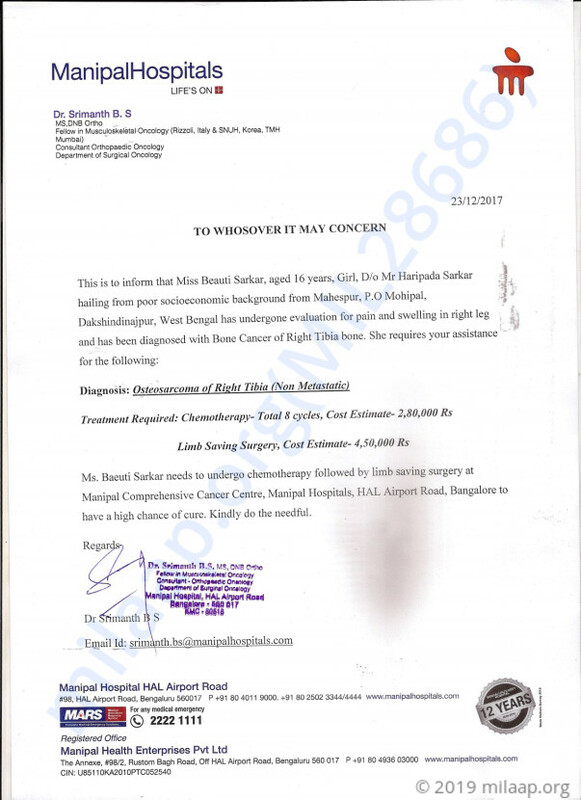 Unsure of what to do next, Haripada got her to Kolkata where the presence of cancer was confirmed. The doctors said that Beauti’s leg had to be amputated if she were to survive. Traumatized by the thought of losing a leg, Beauti and Haripada refused to give up and in December, they came to Bangalore seeking alternatives. Thankfully, the doctor told them that the amputation wasn’t necessary and she could get better with 8 cycles of chemotherapy and a surgery to save her leg. “While she was sick, we travelled to different cities to get her checked. Now, finally, the doctors said that after the surgery, Beauti will recover! As a father, what more can I ask for?” said Haripada. Haripada is a farmer in rural West Bengal and works on other people’s farm for a meager wage of Rs 3,000 per month. Haripada is the sole bread earner and hasn’t been able to save any money. For the treatment till now, Haripada has exhausted all his resources and is in dire need of help to save his daughter now. The estimated cost for 8 cycles of chemotherapy and the limb-saving surgery is approximately Rs 7.3 lakhs. Haripada has no means to pay for this and is helpless. 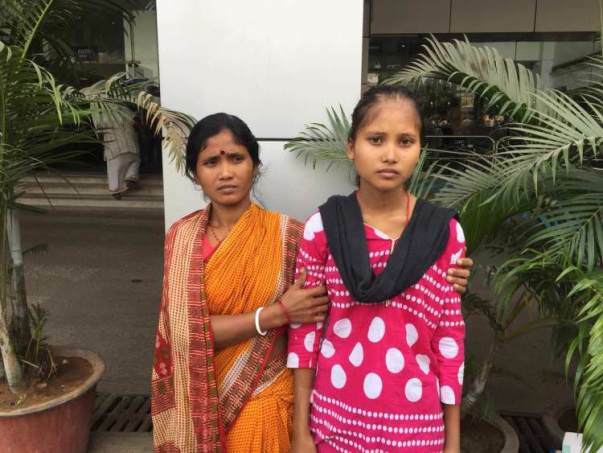 Beauti is an intelligent and ambitious child from rural West Bengal and instead of studying for her board exams, she’s in the hospital fighting cancer. Her father, Haripada is a really poor farmer and has done all he can to provide for Beauti until now. He has no way to arrange for the surgery and now, he needs your help to save his daughter. Your contribution will help save Beauti's leg and her life. We would like to inform you that Beauti Sarkar is doing really well. She is now able to walk properly. She is on continuous follow up with the doctor and is showing very good signs of recovery. We are all very hopeful for her complete recovery and will keep you posted on her progress. Thank you for the wonderful support that you have shown towards Beauti Sarkar. She is doing better now compared to earlier and has been discharged from the hospital as her vitals and health improved. She has been advised regular follow-ups until her health completely stabilises. Please do pray for her health and speedy recovery.